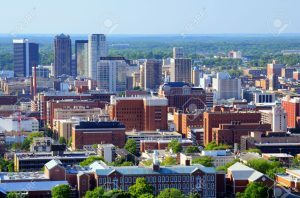 A major hub for business in the south east United States, Birmingham is the largest city in the state of Alabama. With a population of a little over 200,000 residents, it is also the 101st largest city in the US. Covering a geographical area of about 150 square miles, Birmingham consists of a densely populated urban center and is ringed by sprawling suburbs. In terms of climate, Birmingham falls into the ‘humid subtropical’ zone. This means that the city and surrounding areas experience hot, humid summers, and mild winters. Precipitation is abundant and evenly distributed throughout the year. Spring and fall months are usually mild and pleasant, although storm and tornado activities are known to occur with some frequency during these periods. Birmingham’s warm weather throughout the year, combined with exposure to some extreme weather events throughout the year, make pest activity somewhat higher than usual compared to the US average. Common pest problems in the Birmingham area include cockroaches, centipedes and ants. Ants can be a problem for many households throughout the US and Birmingham is certainly no exception. These highly social insects invade homes in large numbers in search of food scraps which they can scavenge and cart back to their nest. For this reason, they are commonly found near kitchens where they enter through cracks or near windows. To help reduce the chance of an ant infestation (and other scavenging bugs such as cockroaches for that matter) it is a good idea to keep a domicile clean and remove potential sources of food, such as open food containers, garbage and even dirty dishes. If ants start to become a problem around the home, a quick DIY fix is to create sticky soap and water barriers around entry points that will stop the pests from entering the residence. Additionally, a professional pest control agent can help to thoroughly remove the pests from the home and track them to their source. Another potential pest problem in the Birmingham area is the centipede. These creepy crawlies come in many different varieties, but the most common ‘house centipedes’ are typically yellow and have 15 pairs of legs. They often enter homes to avoid extreme weather (in terms of either heat or precipitation) and feed on ant and silverfish populations. If centipedes are discovered in a home, not only does this suggest that there is a risk of centipede infestation, but there is likely an infestation of the insects that centipedes feed on too. Because of this, it is strongly recommended that a certified pest control agent examine a home for signs of an infestation when centipedes are found in a domicile. They can take care of the centipede population in a home, while searching for and treating other infestations. There are a number of reputable pest control service providers in the Birmingham city area. A good choice for a go-to exterminator is American Pest Control. American Pest Control is a local company that has been servicing Birmingham and surrounding areas since 1945. They offer a range of different extermination services from rodents, to termites and other common house pests, and also have a range of pest prevention treatments. Other reputable pest control companies in the area include Remedy Pest Control and Alabama Professional Service.